This one is a bit of a double-edged-sword for me. 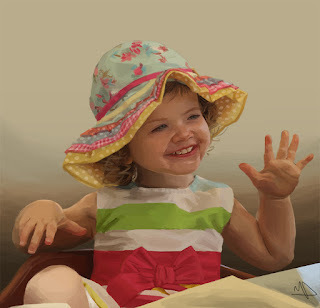 I did this photoshop painting for my girlfriend's neice's 3rd birthday. Due to time constraints I used the eye-dropper tool on the original photo for picking colours. So while I'm happy with the finished painting, I also feel like I cheated which dilutes the satisfaction. I try not to use the eye-dropper tool as much as possible and pick the colours myself to help improve my colour theory. So am I a big fat fraud or does the end justify the means? If anybody has any opinion on what I'm talking about, I'd love to hear it. I don't think there is anything wrong with using the eyedropper tool and you've said it yourself, you prefer to pick the colours yourself normally. However in this instance it was a requirement to use the colour picker to speed up the process. Personally I think it shows good work ethic that you wanted it done in time so you used the tools at your disposal. Besides whether or not the tool picks the colours or you do, Photoshop can't tell you how to use them. You've painted an amazing portrait here Mick. Yeah true, I suppose it's trying to find a balance between your own satisfaction and saving time. So far as personal satisfaction goes I think you cheated yourself. There's a lot of fun in exploring colour theory and in a way puts more of your own eye into the final result; Reality as viewed by Mick. However! It's a lovely piece. You should take lots of satisfaction with it, a great amount of skill went into the process, it's rendered beautifully - Your dear friend Simon. Thanks Simon, very constructive criticism... I like it. Wow...that's pretty feckin brilliant Mick.